Since that show, Benedict and other SOAP-ers have worked frequently with The Annoyance (they just wrapped up a play there about crime-fighting orphans called Orphan Action League), and have put together a lineup of funny folk they’ve met doing stuff there, as well as others from UCB and The PIT, including acclaimed sketch group Murderfist. 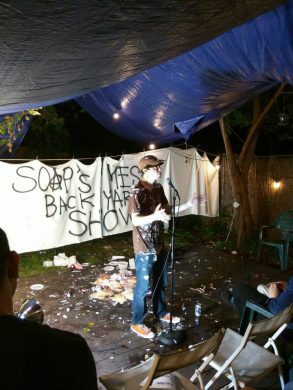 I know you’re curious: what sort of things even happen at a messy comedy show? Well, there won’t be a lot of plain old stand-up, but rather more sketches, bits, and characters so as to more fully explore the freedom to make a mess. 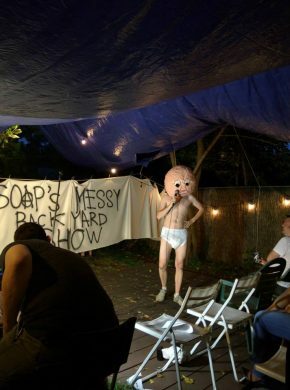 Benedict tells me it usually includes “some food and a bodily fluid,” and some past highlights are someone making a massive ice cream sundae onstage and a man-baby with a big papier-mâché head who pulls lollipops from his diaper and throws them at audience members while telling jokes. Also, there was “a sketch about an inbred family and one of the children was just a bucket of sludge and guts [who spoke] from a god mike upstage.” The bucket-guts were made from baked beans, kimchee, and a whole octopus they found at a grocery store. As thrilling as this concoction sounds, Benedict says they’re trying to “not go a smelly route anymore,” so at least your noses will be safe. The address for this shindig is a secret that will be revealed upon RSVP, which Benedict tells me is less about keeping up an air of mystique and more for the sake of the landlord not getting mad. It’s good to see some form of practicality going on here. After all the laughs, Benedict says, “Some people might be bringing instruments and doing a noise music jam afterwards. I don’t know if that’ll pan out. 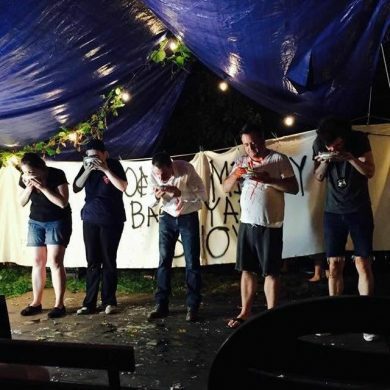 We’ll improvise.” And if you’re worried about anyone slipping in goo, he says they’re “pretty used to having to clean up after [themselves].” Whatever happens, he says that everyone should hang around after the performances for a good old fashioned house party. 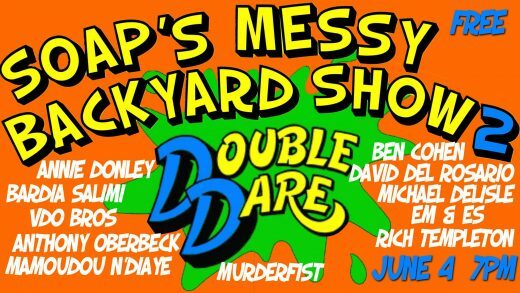 SOAP’s Messy Backyard Show 2: Double Dare is on Saturday, June 4 in a secret location in Williamsburg. Doors at 6pm, show at 7pm. Free. RSVP using this form.